A family gathering just wouldn't be complete without a big dish of Homemade Banana Pudding gracing the table. Now I'm talking about the real deal here with homemade pudding, layering the cookies and making a homemade meringue for the top. Now, that's that's how mom and grandma used to make it. You can always do the quick stand by using boxed vanilla pudding and whipped topping, but to me that's not banana pudding. Plus making the homemade version really doesn't take any longer to make than the instant pudding one. So why not make the real thing!!! 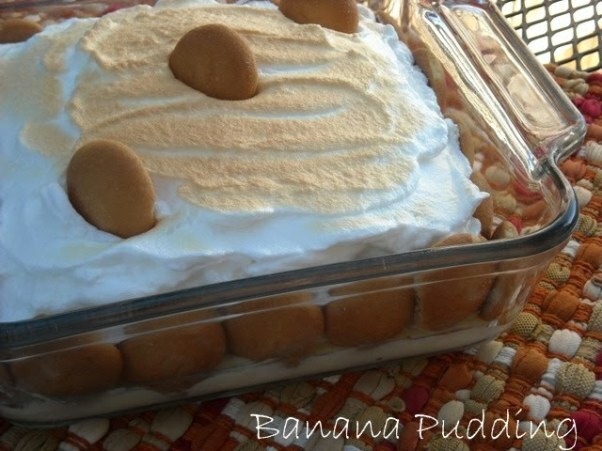 Actually the only instant banana pudding recipe that I will eat is Paula Deens recipe for Not Yo Mama's Banana Pudding. It definitely isn't my mamas recipe, but it is sinfully decadent with the addition of cream cheese and sweetened condensed milk and something I think everyone should experience. In fact I have made it for special occasions or parties and everyone raves about it, but that's it, that's it as far as I will go with banana pudding and the instant stuff. Just about any holiday that comes around my mother in law always makes a big dish of banana pudding. It's the perfect standby and everyone loves it. Honestly you really can't go wrong with an old favorite. If you were raised in the south then you pretty much had the meringue version of banana pudding. This recipe is also no secret and you will find it on every box of Nilla Wafers so it's been around for quite a while. I also have to say that using the Nilla Wafers is the best! I don't know there's just something about good old Nilla Wafers. If meringue scares you because of the raw egg whites then you can solve that problem by substituting with meringue powder. To me banana pudding just isn't banana pudding without the fluffy marshmallow like meringue topping. Lets get started and make some banana pudding. To start using a double boiler, mix 1/2 cup sugar, flour and salt in the top part of the double boiler. If you don't have a double boiler you can use a make shift double boiler by using a medium sized pot and placing a glass bowl on top (place the water in the pot and the pudding ingredients into the bowl). Separate the egg yolks form the egg whites, and set the egg whites aside for the meringue topping. Add the egg yolks to the top of the double boiler and then the milk. Cook, uncovered, over boiling water, stirring constantly for 10 to 12 minutes or until thickened. Remove from heat; stir in vanilla. Slice up the bananas. My little helper for today is Mackenzie! I'm so proud of Mackenzie she has learned to do so many things in the kitchen and is quite the helper lately. I let her assemble all of the banana pudding except the meringue. She gets so excited when she can prepare almost all of the recipe by herself. Spread a small amount of pudding - custard on the bottom of 1 1/2-quart casserole (I used a 8 x 8 inch baking dish) cover with a layer of wafers and a layer of sliced bananas. Pour about 1/3 of custard over bananas. Continue to layer wafers, bananas and custard to make a total of 3 layers of each, ending with custard. I used a 8 8 inch baking pan, so I only had two layers. Mackenzie thought it would be pretty to arrange all the wafers around the sides of the dish and some in the middle. It's so funny she told me its all about what do you call it mommy? Presentation!!!! Good memory Kenzie your're learning well. Beat the egg whites until soft peaks form; gradually add remaining 1/4 cup sugar and beat until stiff but not dry. Spoon on top of pudding, spreading evenly to cover entire surface and sealing well to edges. Bake at 350°F in top half of oven for 15 to 20 minutes or until browned. Watch it closely it might not take the full time to brown. It really depends on your oven. Cool slightly or refrigerate until ready to serve. Garnish with additional wafers and banana slices just before serving. Using a double boiler, mix 1/2 cup sugar, flour and salt in the top part of the double boiler. If you don't have a double boiler you can use a make shift double boiler by using a medium sized pot and placing a glass bowl on top (place the water in the pot and the pudding ingredients into the bowl). Separate the egg yolks form the egg whites, and set the egg whites aside for the meringue topping. 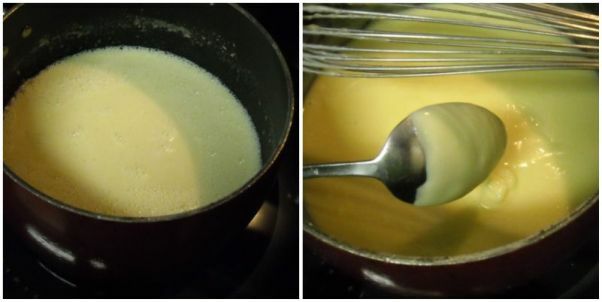 Add the egg yolks to the top of the double boiler and then the milk. Cook, uncovered, over boiling water, stirring constantly for 10 to 12 minutes or until thickened. Remove from heat; stir in vanilla. Spread a small amount of custard on the bottom of 1 1/2-quart casserole; cover with a layer of wafers and a layer of sliced bananas. Pour about 1/3 of the custard over bananas. Continue to layer wafers, bananas and custard to make a total of 3 layers of each, ending with custard. If you use a 8 x 8 inch pan you will only have 2 layers. Beat the egg whites until soft peaks form; gradually add remaining 1/4 cup sugar and beat until stiff but not dry. Spoon on top of the pudding, spreading evenly to cover entire surface and sealing well to edges. Bake at 350°F in top half of oven for 15 to 20 minutes or until browned. Cook's Note: If you have a problem with the raw eggs in the meringue topping, you can always use meringue powder in place of the egg whites. If you cannot find Nilla Brand wafers Mothers brand is a good substitute. Yum! I've never made banana pudding. Last week I had to hide some bananas just to be able to use them in bread. Guess I need to hide some more so I can make this. My family loves Banana Pudding, I've never made it completely from scratch though. Thanks for sharing this recipe, I'll be trying it soon. Guys the homemade version is just simply to die for. Once you make it homemade you will not go back to the boxed version. Thanks for stopping by and have a great day. Mmm, I agree! I have only made homemade pudding a couple times, and I agree, it IS really good! This sounds great, I love cool creamy desserts. Oh Man. You just hit on a real weak spot of mine. I LOVE banana pudding. And I'm especially big on doing it the right way (from scratch that is). I will definitely be trying out this one. I love banana anything! you got me! My family has been begging for homemade banana cream pie so with this recipe they win, but I'll try your recipe. Banana Pudding is real southern comfort food, and if it is made from scratch it is even better. I have to try out your recipe. Yummy for my Tummy!!! wow- looks delicious, graet job. I have made one similar but coated the bottom in chocolate, also delicious. 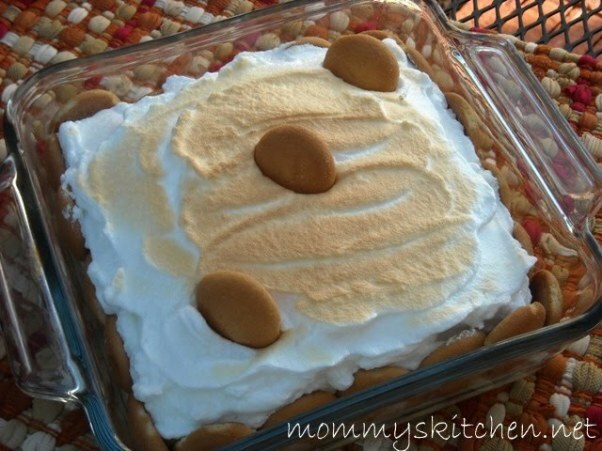 I love homemade banana pudding, too! It blows the pudding mix version out of the water. I am going to make banana pudding for a potluck but am going to make individual ones in some plastic glasses I bought and put a plastic spoon in each one. I have noticed that some times at potlucks people get carried away with the amount they take. Also this will be easier for little ones? Tina, I just made this for the first time!!! I LOVE how it smells and tastes so far.. cannot wait for it to cool off and to share with family and friends! Thanks for sharing!! I want to thank you for this recipe. You can not make authentic southern banana pudding without using a double boiler as your recipe calls for. I am 65 years old and remember well watching my mother make banana pudding. It was delicious. I can assure everyone that this is an authentic southern recipe. Thank You.